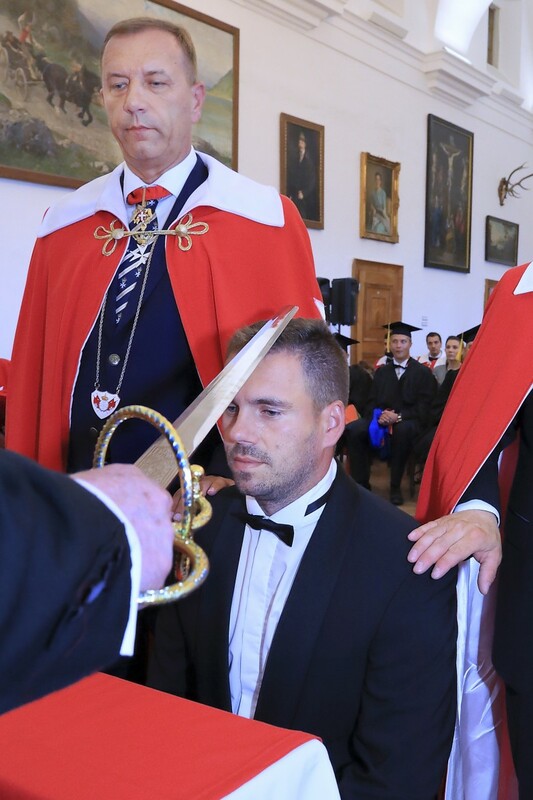 The knighthood ceremony, to this day, has retained its noble traditions, its symbols, the typical Knights’ outfit – dating back for several centuries – also in our changing times. Without tradition, people's lives would be more bleak and rootless. 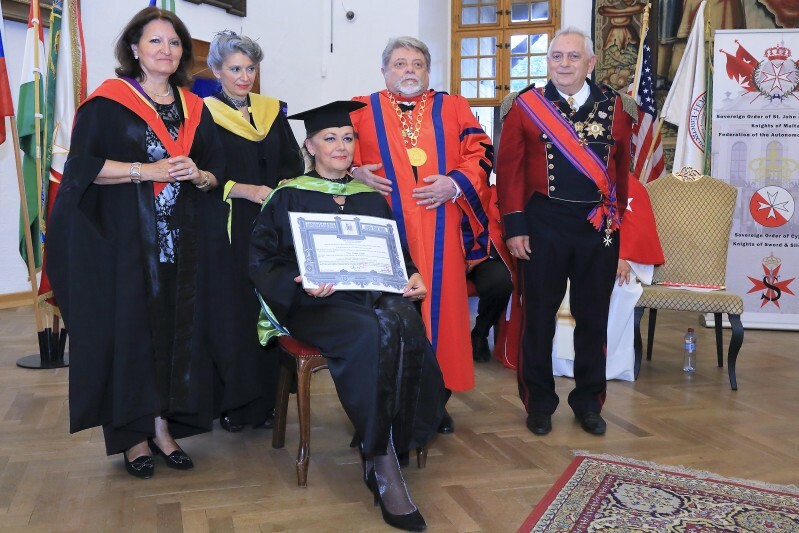 It is an exceptional occasion when guests can gain insight into the solemn moments of the investiture and the mystic world of knightly life that has always been of great concern to the outsiders. 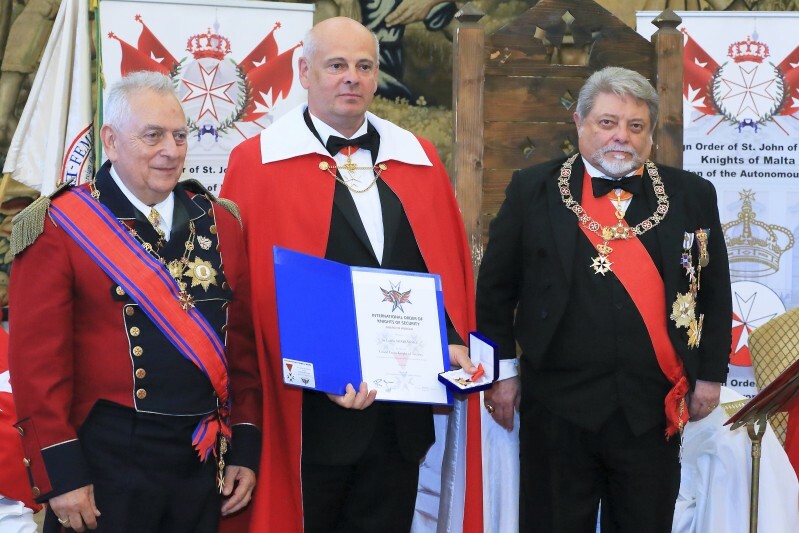 To belong to the Order carries the members with legitimate pride – which also imposes an obligation on them – who have earned the knighthood membership for their own human values, individual qualities and merits, and with their generous work for the country's society. 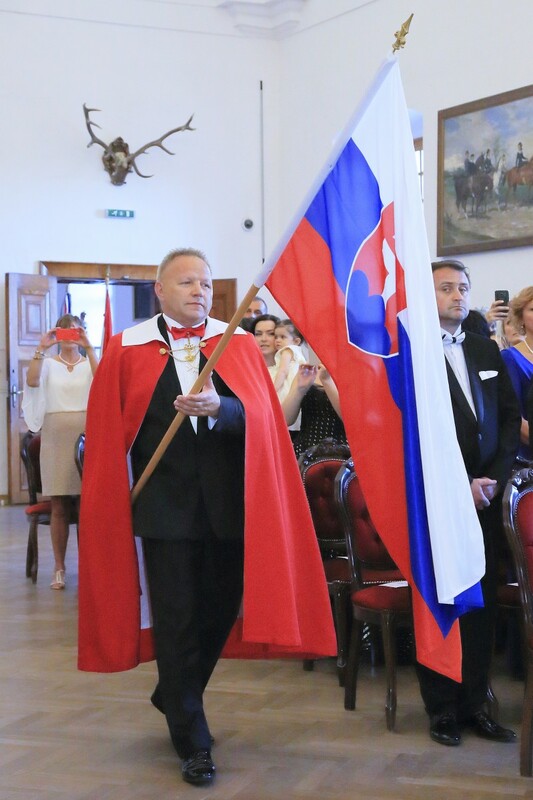 On the 23rd June 2017, the Slovakian and Hungarian Grand Priories organised jointly the 31st Ceremony of Investiture of the Sovereign Order of Saint John of Jerusalem, Knights of Malta, Federation of the Autonomous Priories (KMFAP) at a special venue, at the Bojnice Castle (Zámok Bojnice) in Slovakia. This magnificent medieval castle was the venue for important events at different times of history. As a result of its special architecture and perfect restoration, it is like a true fairy tale castle, where a sparkling life takes place and we can soon see its inhabitants. In front of the castle gate there is a huge, more than 500-year-old linden tree, which was struck by lightning, but it seems indestructible. 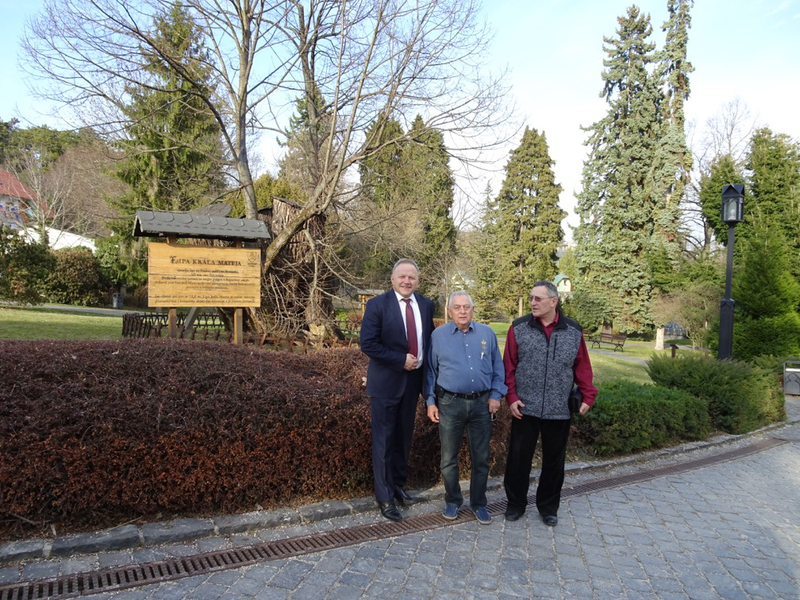 According to the plaque, it was the favourite tree of King Matthias during his frequent visits to Bojnice, and sitting under the tree he formulated and dictated to his clerk the laws of his country. 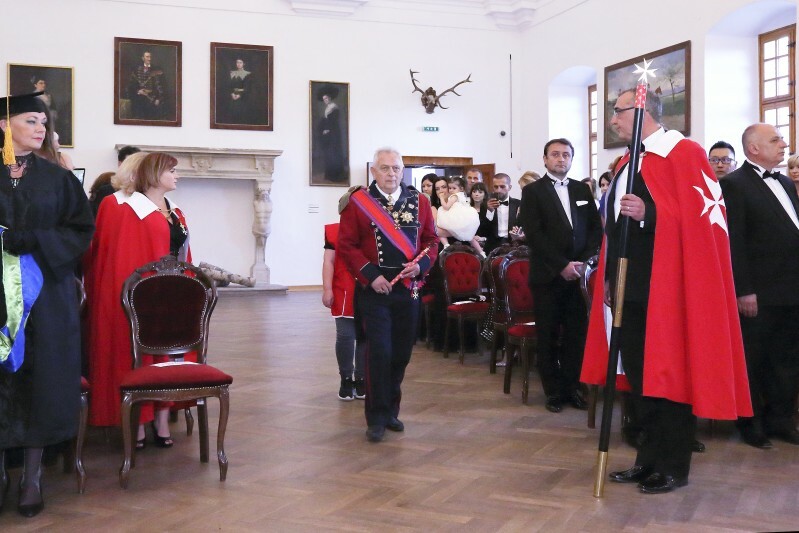 Well, the Knighthood Ceremony of the Knights of Malta (KMFAP) and the Sovereign Order of Cyprus (Knights of Sword and Silence) took place in this unparalleled historical environment and in the elegant Hunyadi Hall of the extraordinarily beautiful castle. Knights, Dames, participants and guests arrived from 13 countries of 5 continents (Slovakia, Hungary, Portugal, USA, Angola, Malta, Italy, Turkey, Czech Republic, Austria, Australia, Hong Kong, Singapore) at this significant event, highlighting the Singaporean candidates and the accompanying large delegation, as well as the first candidate from Australia, who was knighted to the Knights of Malta during this ceremony. 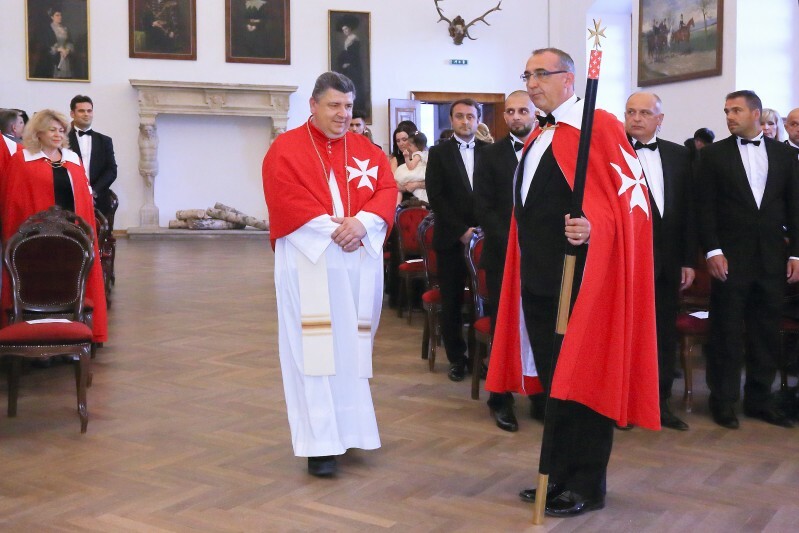 During this event, the Candidates of Knights of Malta and of the Sovereign Order of Cyprus met the Grand Master – HMEH Prince José, the highest leaders as well as the knights and dames of KMFAP. 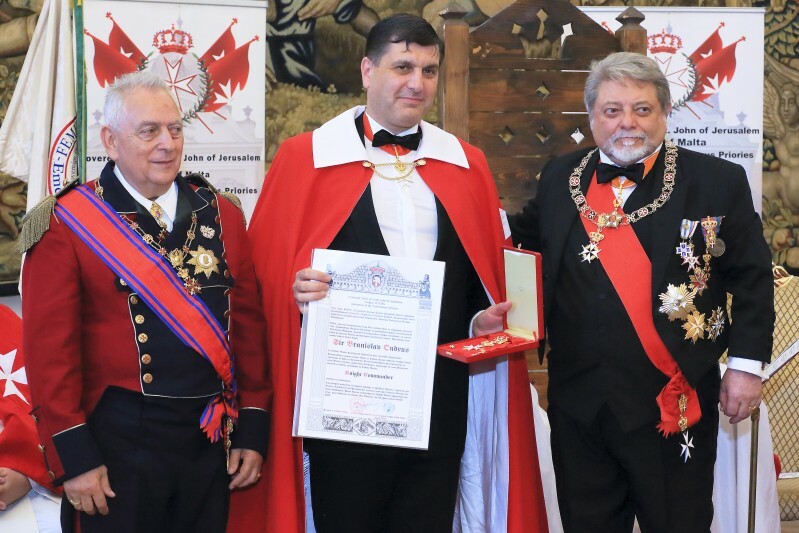 Their introduction and appreciation was the responsibility of the recommending knight or dame, who emphasized the qualities and merits of the candidates to the present guests and to the Grand Master. 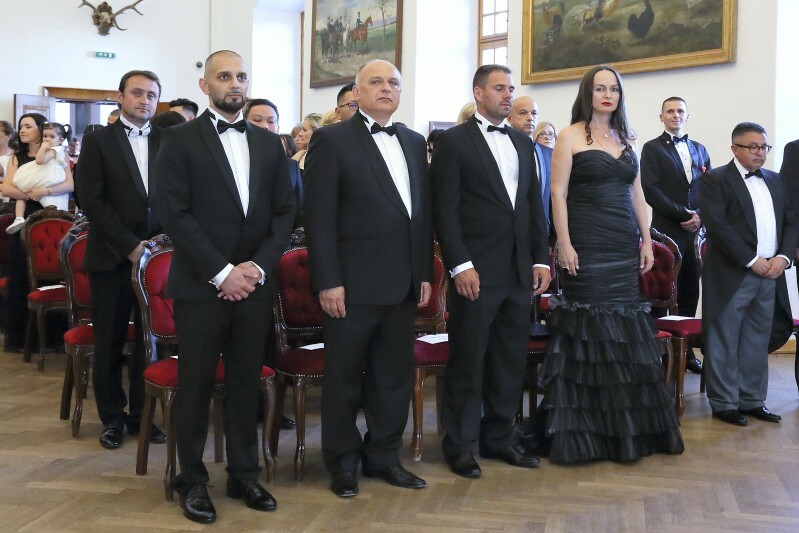 These candidates became worthy to be members of the prestigious family of the Knights of Malta, or the Sovereign Order of Cyprus in order to carry on the heritage of our venerable predecessors in the modern era, and to enhance our glorious past. 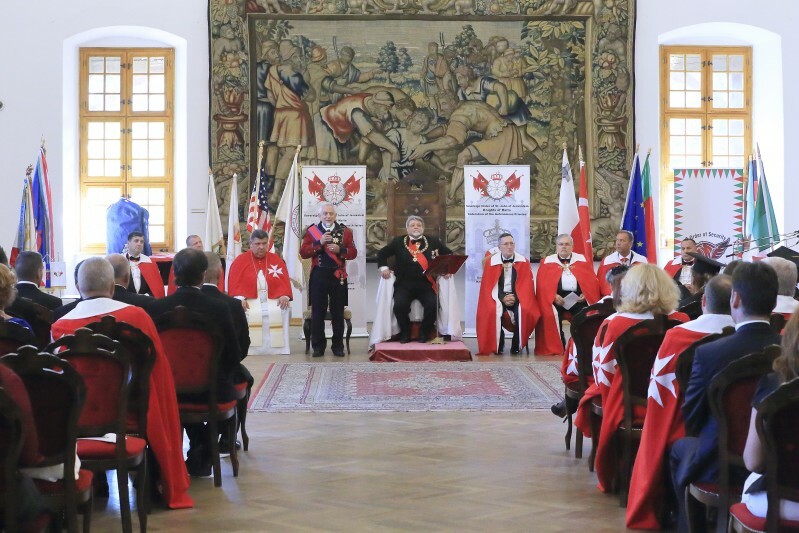 Presentation of the most important objectives, structure, outstanding events and diplomatic activities of the Knights of Malta Order and the State is an essential part of the so called “Watch of the Arms”, a tradition that has existed since the founding of the Order and precedes the knighthood ceremony. The first encounter of the Postulants ended with a common meditation, which is always soul-lifting for them. 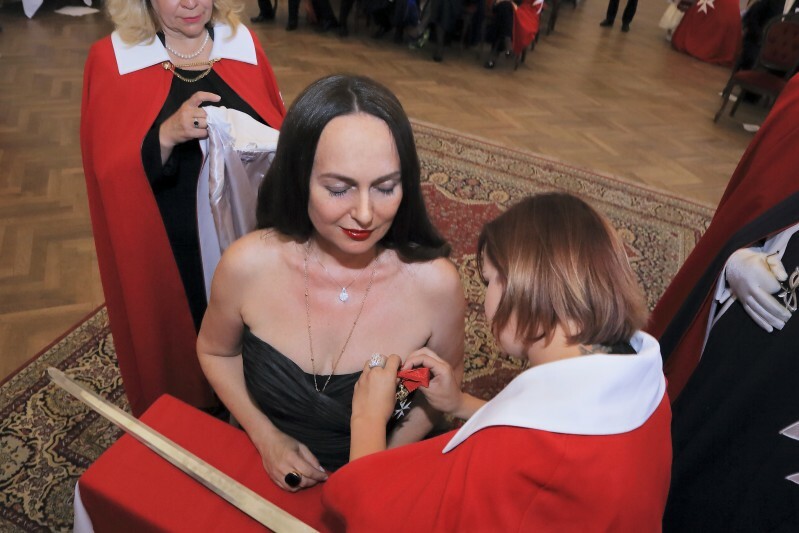 Preparing for the upcoming moment of the investiture, with the help of knightly symbols and requisites they recall traditions and customs of the past, and receive their official Postulant diplomas, and the Ten Commandments of Chivalry. On the 23rd June, early in the evening everything was ready in the Hunyady’s Hall to begin the solemn knighthood ceremony. 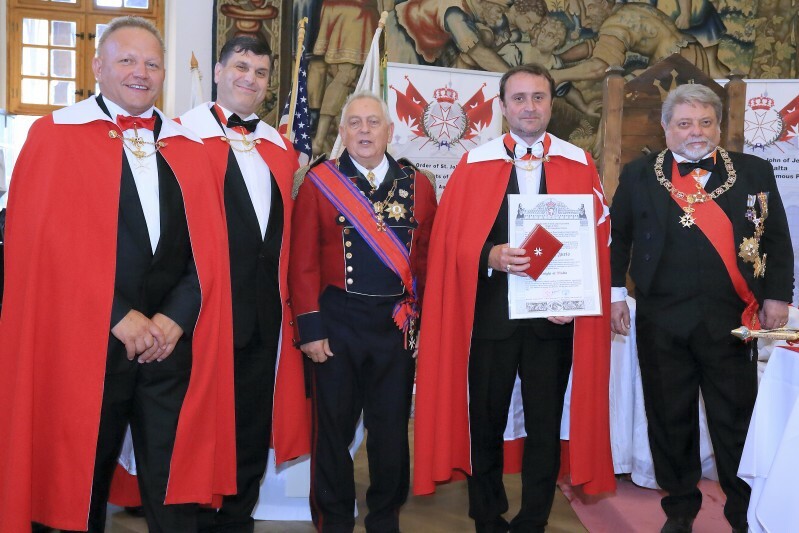 The castle's beautiful and prestigious ceremonial hall was dressed in the flagstones of the Knights of Malta and the Cyprus Orders, complemented by the national flags of those present. 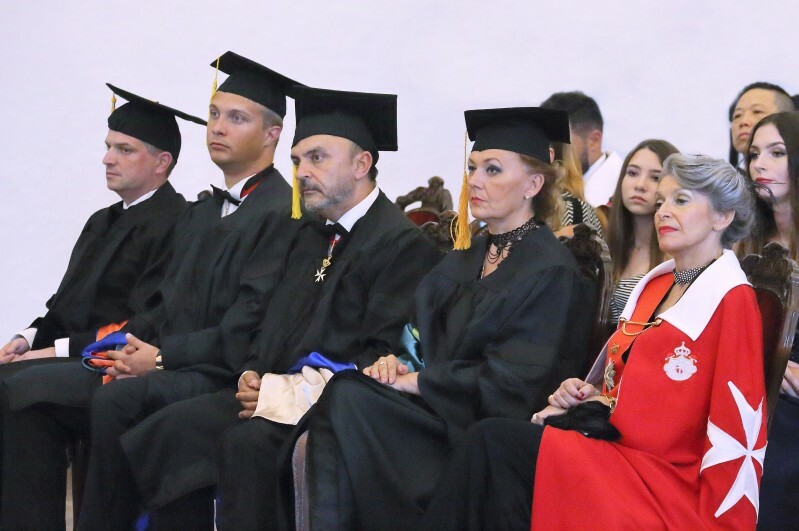 The inauguration ceremony started at 18.00 with the fanfare sounds of the solemn marching in: first the knight and dame candidates – as the most important participants of the day, followed by the candidates of Honorary doctorate – awarded by Pro Deo State University. Then the knights and dames of KMFAP and of the Sovereign Order of Cyprus took their place. Members of the Government of our State were coming into the hall in ascending rankings, lastly arrived H.M.E.H. 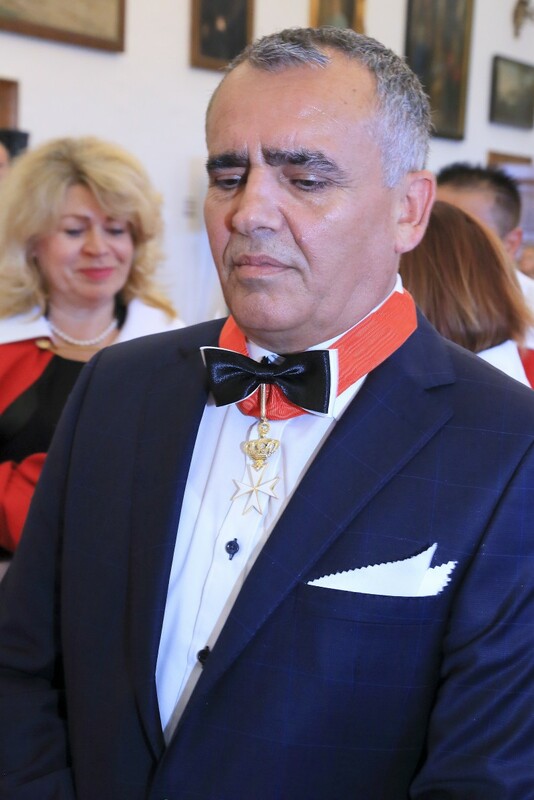 Prince José, Grand Master of the Order and Lady Isabel, then the inauguration swords of Knights of Malta (KMFAP) and of the Sovereign Order of Cyprus entered. 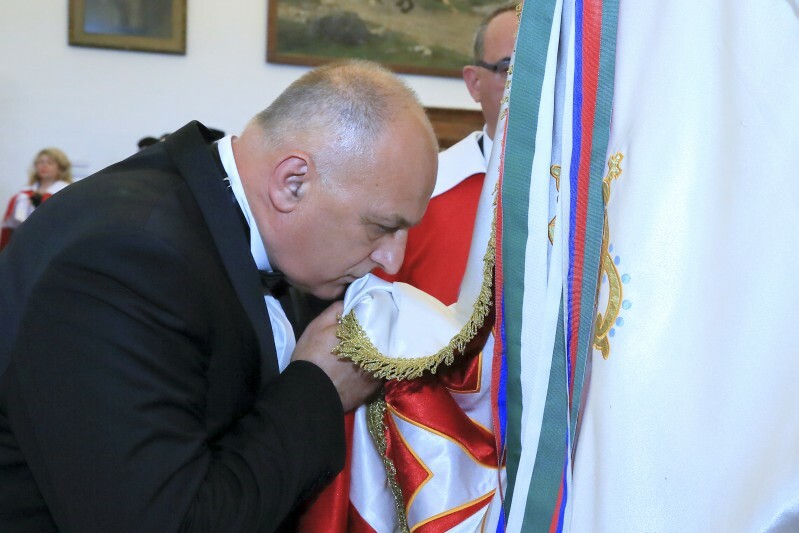 Last, but not least the flags of Slovakia, Hungary, the Sovereign Order of Cyprus and the Knights of Malta marched in and accordingly, the Slovak and Hungarian national anthems were sounded, followed by the orchestrated KMFAP anthem. 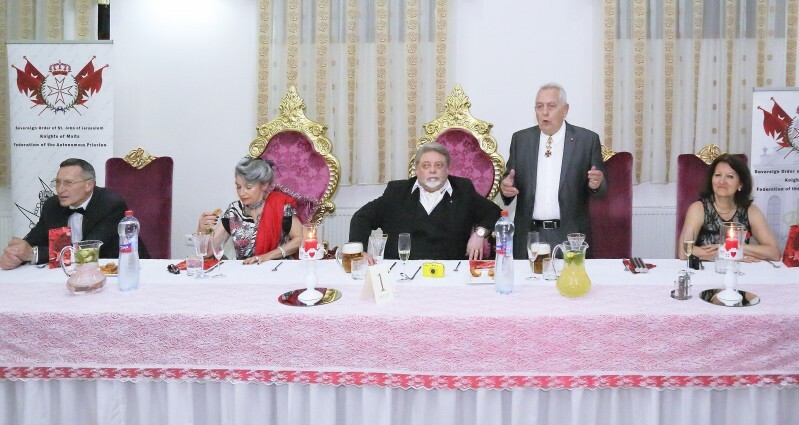 After the Grand Master’s welcome speech to the guests, we commemorated our deceased knights and dames, and also those, who struggle with serious disease therefore could not be present. For all of them, Schubert – “Ave Maria” was performed by Andrea Danková – famous Slovak soprano. 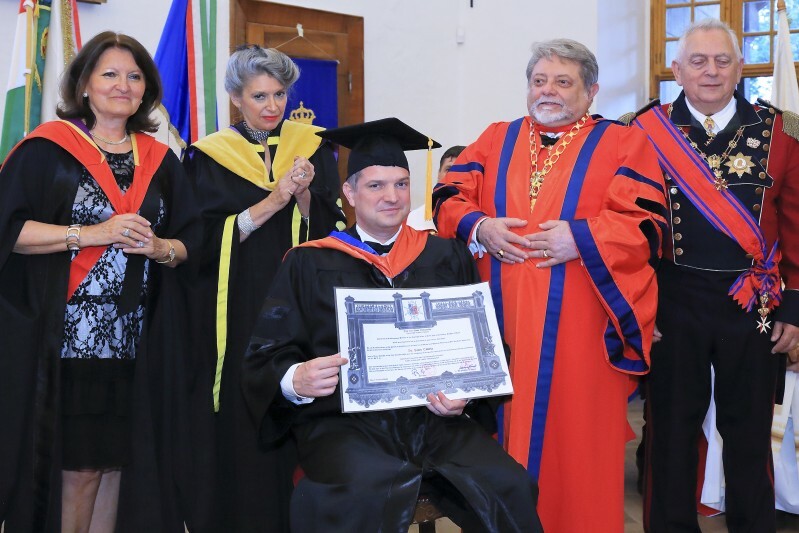 The Grand Master – as usual – gave a speech to the Postulants, in which he spoke about the significance of hope and the important role of women, which can help to improve the world, therefore he set the Ladies of the Order – doing excellent and outstanding work – as role models for others. 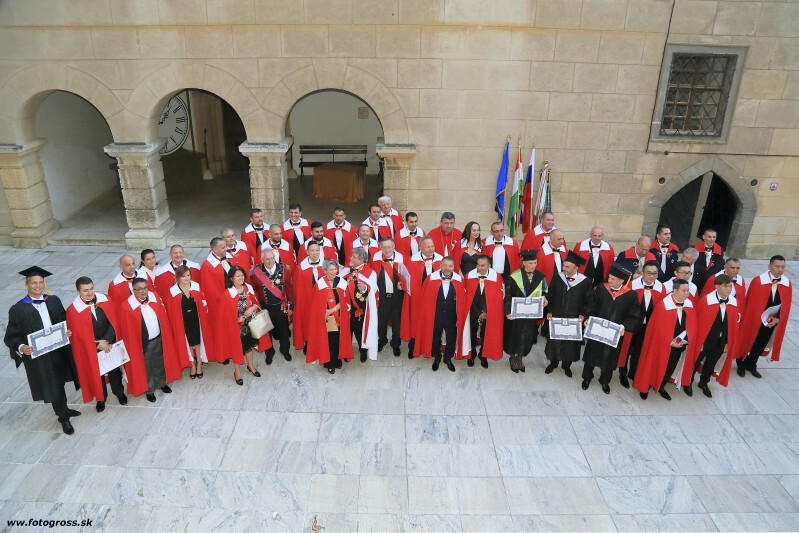 The members of KMFAP belong to different religious denominations, this religious pluralism is also faithfully reflected in the composition of the members of the Magisterial Board of Religious Council. 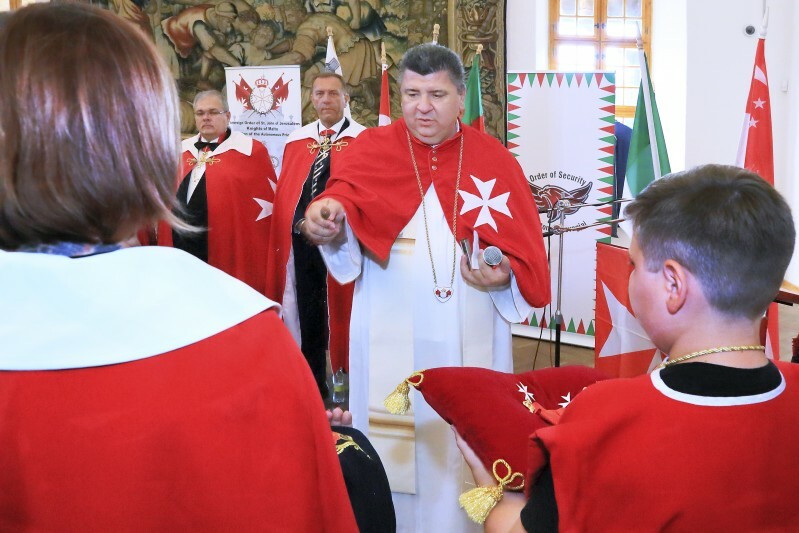 Blessing the knightly requisites and symbols of KMFAP and of the Sovereign Order of Cyprus – which were given to the Postulants during their inauguration, and afterwards they can wear – was made in the nam e of all religions by Sir Mgr. Pavol Zemko, Magisterial chaplain. After signing the Oath, and saluting in front of the flag by kissing it at the angle, the Postulants – accompanied by their godfather(s) / godmother(s) – kneed down on the prie-dieu in front of the Grand Master, and the traditional 3 sword-touches formally declared them to be knighted. 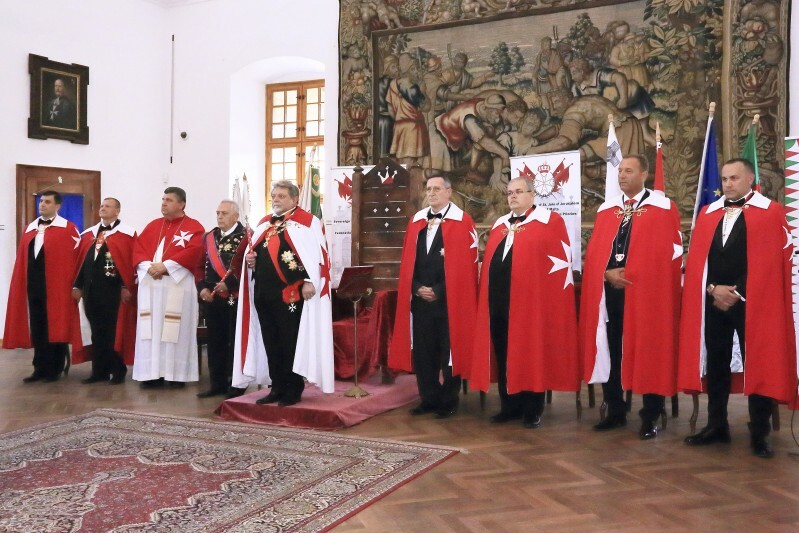 According to the international nature of the investiture the Order of Knights of Malta and the Sovereign Order of Cyprus knighted 14 new candidates from 5 countries (Australia, Hungary, Singapore, Slovakia, Turkey). 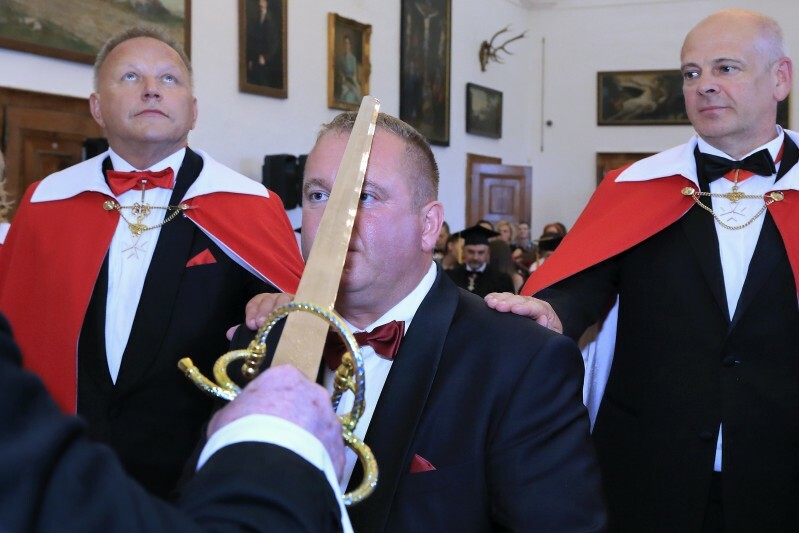 The Knights of Malta (KMFAP) invested 12 new knights and 1 dame, while the Sovereign Order of Cyprus, the military wing of KMFAP – knighted 1 gentleman, who became member of the privileged group of the Knights of Sword and Silence. 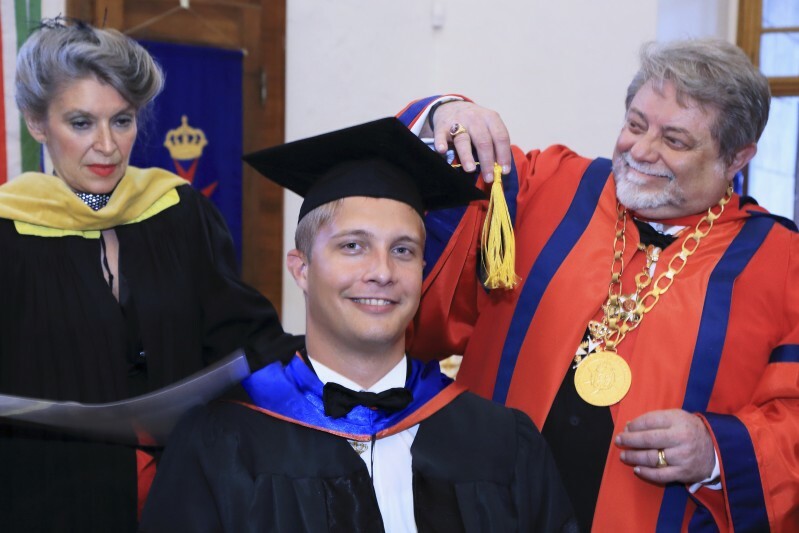 In the short breaks of the two-hour period of the Knighthood Ceremony, classic and modern musical inserts sounded, suitable for the occasion, in the great interpretation of Dávid Schwartz this time. At the end of the ceremony, we were witnessing the awarding of promotions and honours. The leaders of KMFAP appreciate and give special recognition to those who work hard for the Order. This time, four of our fellow knights were promoted advancements, and two knights were honoured with decorations to acknowledge their merits. 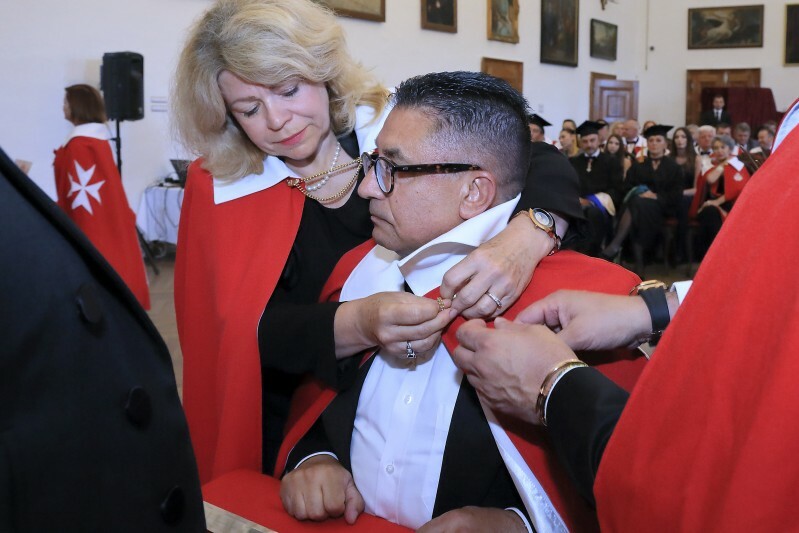 Closing the Ceremony of Investiture, the Honorary doctoral celebration of the Pro Deo State University (PDSU) – which is in operation of the Knights of Malta (KMFAP) – took place, where such recognitions were expressed and transferred, which praise whole life paths and human affiliations. 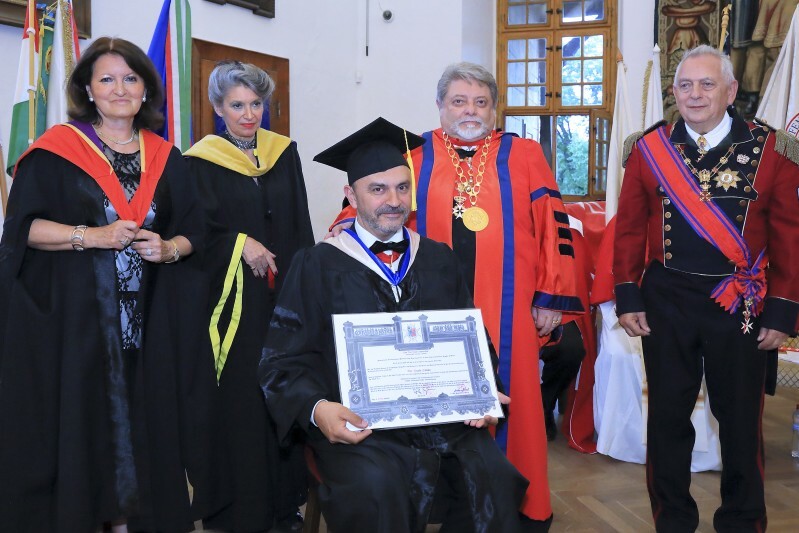 Professor José Manuel Costa da Veiga Cosmelli, rector, Lady Isabel Cosmelli and Lady Anna Popper, members of the Academic Council, handed over the honorary doctorate certificate to four people, who earned this very high award. We convey our congratulations to the new Knights and Dame, as well as to the PDSU honorary doctors. 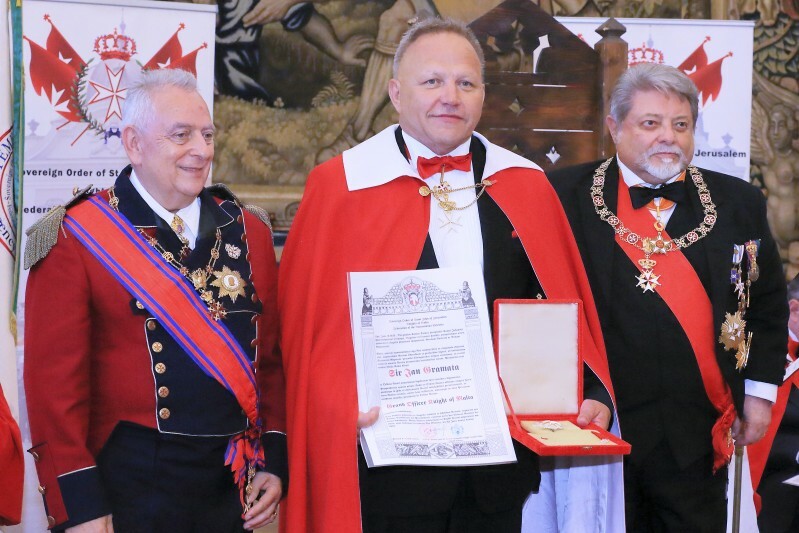 We count on their dedication and selfless work to strengthen the rank and reputation of the great Order of Saint John of Jerusalem, later called the Knights of Malta, all over the world, worthy of our glorious predecessors, with special regard to the principal activities of the knights in the 21st Century, and to the main task of the Order: the humanitarian work for the needy, without racial, religious, political or gender discrimination. 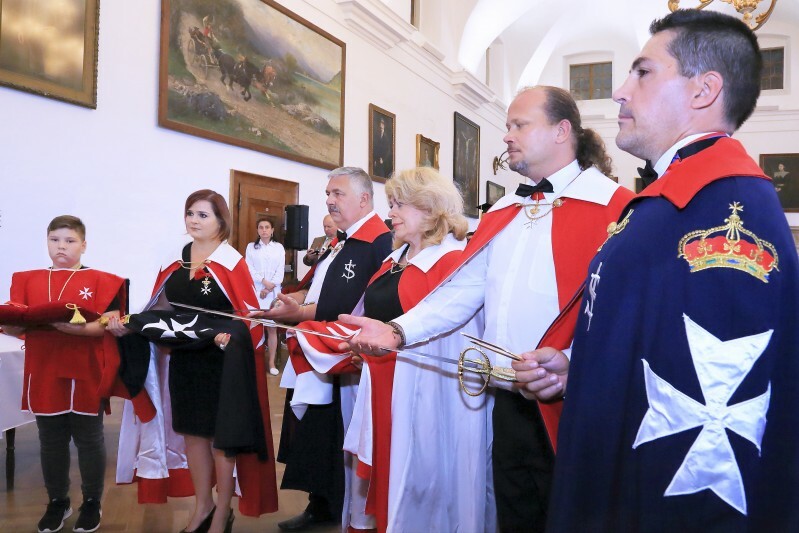 On behalf of the leaders of KMFAP, we would like to express our gratitude to all those knights and dames, who selflessly and effectively assisted and so contributed with their devoted work to the success of the 12th Slovakian investiture, with special regard to the members of the Slovakian Grand Priory, who played a significant role in the selection of this special venue and in the organizing work. 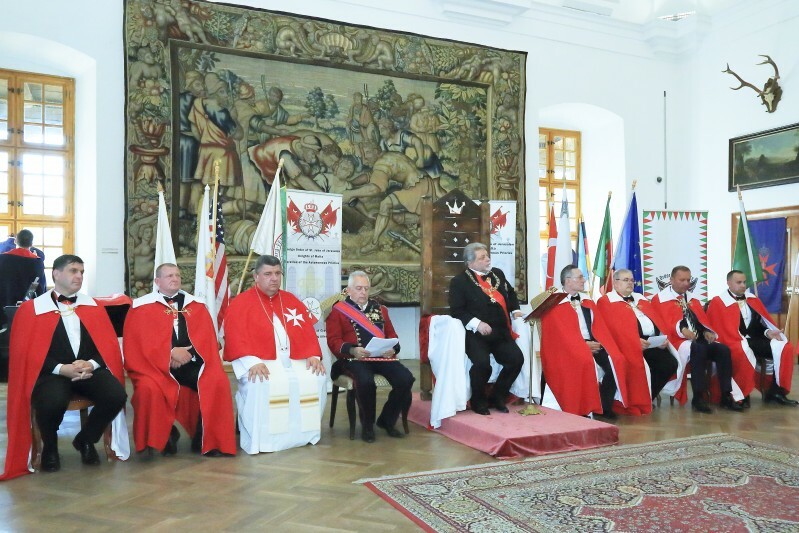 We express our gratitude also to the members of the Hungarian Grand Priory for not only participating in the ceremony despite the distance of hundreds of kilometres, but also contributing to the success of this worthy event with their powerful help. After the official photo shoot, we invited all participants to the Gala Banquet, in one of the most popular restaurants of Bojnice, the Slavia Restaurant, where a rich buffet dinner, local and international specialties, knights' cake, music, dancing and a real Slovak folklore show, and great atmosphere awaited about one hundred guests.